This offer is for a studio with a partial kitchen sleeping up to 2 people. Princeville's Best Spot to Splash, Serve or Swing! 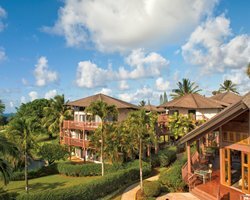 Wyndham Ka'Eo Kai, the first resort situated just past the Princeville entrance, perfectly captures the ambience of the "Garden Island" while offering a variety of water, golf and tennis pleasures. 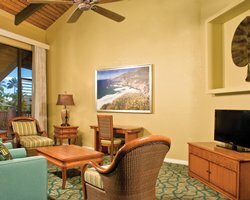 Enjoy beautiful views from every unit, exotic surroundings that pay tribute to Kauai's environment, intimate nature trails, picturesque pools, club house activities and a golf lover's dream spot between the number 3 fairway of the Makai Golf Course and Princeville's historic tree lane. a TV, VCR, stereo, washer and dryer. dishwasher, toaster and a coffeemaker. 1BR units OCC: Max 4/Pri 2 have 1 bath. based on the size of the unit confirmed. The range is between US$20 - US$40 approx. to discuss special needs: 808/826-6549.